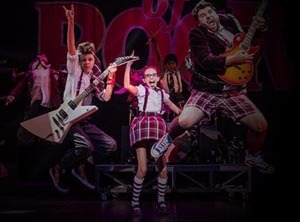 While no one can ever truly replace Jack Black as Dewey Finn from the movie version, School of Rock LIVE is a fun musical version of the movie that will keep your family smiling and entertained. Great cast, and the talented kids who perform in the in the show are all actually playing the instruments onstage - and they are impressive! This high energy performance is full of music and laughs, (and even a few touching moments for parents - e.g. 'if only you would listen'). It's playing at the Boston Opera House thru February 24 - a great option for February Vacation Week.